1) Preheat the oven to 250°F. Lightly grease two large rimmed baking sheets; or line them with parchment. 2) In a very large bowl, combine the oats and nuts. Mix well. 3) In a separate bowl, whisk together the oil, salt, maple syrup, and vanilla. 4) Pour the wet ingredients over the dry mixture in the bowl, stirring and tossing until everything is very well combined. 5) Spread the granola on the baking sheets, patting it gently to flatten. 6) Bake the granola for about 90 minutes, stirring the mixture with a heatproof spatula every 15 minutes or so. You want to bring the granola at the edge in towards the middle, so it all browns evenly. Reverse the baking sheets in the oven (top to bottom, bottom to top) each time you stir. 7) When the granola is a medium golden brown, remove it from the oven and cool completely on the pans. 8) Transfer the granola to a large bowl, and mix in the dried fruit. 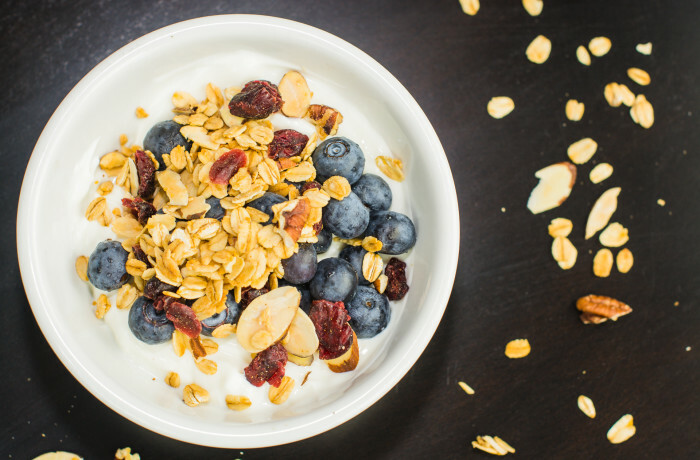 9) Store the granola in a tightly closed container at room temperature for several weeks; freeze for extended storage. Or portion into pretty patterned plastic bags for gift-giving. © Copyright 2019 Focusedonfit All Rights Reserved.